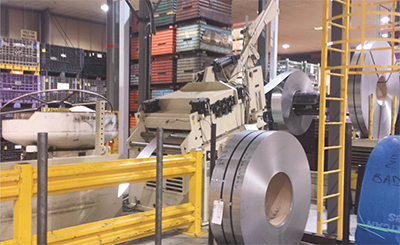 To ease capacity concerns and push the company’s understanding of new technology, in 2014 Bayloff Stamped Products installed a 600-ton servo-driven press and transfer system. The line has proven valuable in producing complex stainless-steel deep-drawn automotive parts. A short hop southwest from Detroit in Bellville, MI, Bayloff Stamped Products earns its keep supplying automotive customers. Via a mix of high-strength and stainless steel as well as aluminum, the company provides a range of stamped and welded products ranging from engine, suspension and transmission mounts to powertrain and exhaust-system components as well as front-end-module assemblies. The Tier Two metalformer employs 16 progressive and transfer presses, from 200 to 1000 tons, to churn out parts and components in two shifts at its 73,000-sq.-ft., 100-employee-strong main facility. Bayloff also maintains a 40,000-sq.-ft. 75-employee welding and assembly facility just down the road as well as a 120,000-sq.-ft. deep-draw transfer operation with 75 employees in Kinsman, OH. In 2001, Bayloff formed another company, WBI, in Westland, MI, that performs CNC tube bending and fabricating. Faced with capacity issues, in 2014 the company began looking to add a press. As the search went on, and as Bayloff consulted with Nidec Minster—“we’ve always been primarily a Minster shop,” says Rich Bayer, Bayloff’s owner —a servo-driven machine seemed like the right route to take. His son Chris, Bayloff’s co-owner, echoes those thoughts. Coil-handling equipment feeds the new servo-driven press at Bayloff, with finished parts routing to an integrated parts washer if required. 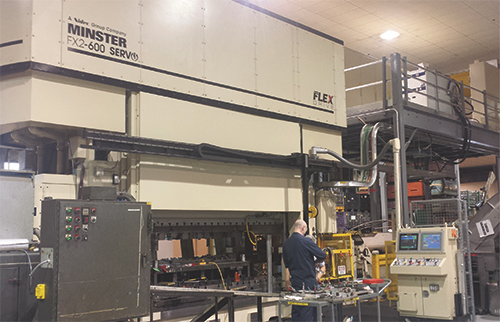 In December of 2014, Bayloff went live with a Nidec Minster FX2 600-ton servo-driven press and accompanying coil line. Based on the company’s E2 HeviStamper tie-rod-frame design, the FX2 servo press features a Siemens servo motor powering the twin-end drive and using liquid-cooling technology as well as a system that optimizes energy usage during production. As compared to air cooling, common on large servo motors, the liquid-cooled drive affords a cooler operating temperature for longer motor life and less heat transfer to the press, according to Nidec Minster officials. In addition, they say, being a closed-loop system, the liquid-cooled drive results in fewer contaminates than a typical air-cooled system that is susceptible to airborne pollutants. The press also features programmable motion profiles with many profile shapes. 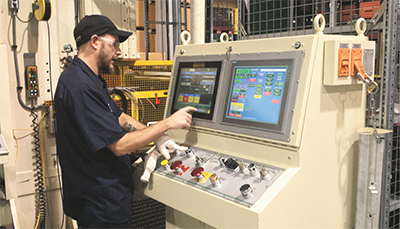 A large operator interface incorporates many of Minster’s Production Management Control (PMC) programming, including complete integration with the coil line. Especially appreciated by lead press operator Brandon Cadreau, who was chosen for this position via his diesetting experience and expertise, is a hand-wheel setup mode, allowing for precise positioning of the slide during job setup and die tryout. Cadreau told MetalForming that the handwheel allows for fine-tuning, providing for quicker and easier setups. Initially, Bayloff strictly used progressive dies in the press. But with a Wayne Trail through-the-window transfer system, integrated as the press was installed, the press has now begun doing transfer work. Common control platforms between the press, coil line and transfer system enable simplified press-line operation, with a hand-wheel setup mode allowing for precise positioning of the slide during job setup and die tryout. Assisting in integrating the transfer system with the press are common control platforms. To make room for the new line, Bayloff transferred welding equipment to its other local facility and also relocated some light-assembly operations. Crews also added a mezzanine to house electrical panels, and the line now sits snuggly in Bayloff’s main press area. Line production includes flow work to reduce capacity issues on other presses, including stamping of high-strength stainless-steel muffler components that require complex double draws. When performing transfer work, the press runs at speeds to 15 strokes/min., and should increase as the company gains experience with the new technology. With that experience, Chris sees benefits in the stainless-steel muffler-component markets.